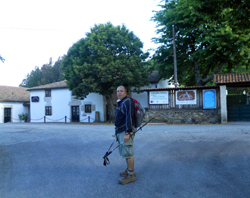 We ate breakfast at 6:30 in Palas de Rei at the same meson and headed out. It was a long day – 28 km of lots of up and down, rolling hills. 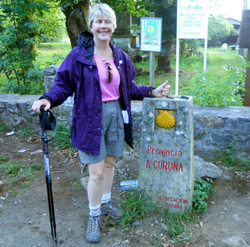 They call this stage of the Camino the “leg breaker” because of its length, not its difficulty. It just wears you out. Even so, we were making great time! We started out the morning walking about 5km in 55 minutes, which is pretty good. Remember, it’s not flat like Yolo County! It certainly wasn’t the kind of day like O’Cebreiro, but it was loooong! The scenery was beautiful. When we rolled into Arzua, it was around 2:00 and because it was Sunday, many locals were out in the bars and cafes having vermouth and tapas before lunch. We knew that the Hotel Suiza was on the far end of Arzua and we had to walk through town and just outside of town we’d find it. However, after walking through the entire town on the main street without seeing a single sign, I was beginning to worry. Finally, we asked someone and they told us it was a little under a km. Relief! This was the first stage that was really really warm in the sun. Thank goodness there was lots of shady lanes we hiked down. As soon as we checked in to the hotel, we had icy cold drinks. Dave now knows how to order a caña which is draught beer. So, he and Tony had several to quench their thirsts. I ordered a Shandy (.9% alcohol beer, mixed with lemon) and immediately had another. We were beat! Once again, the hotel walls seemed to have no insulation in them at all. We could hear everything. However, it was clean and comfortable, which is the most important thing on the Camino. We washed clothing thinking that because of the wamr day, light breeze and early arrival, the clothes would all dry. Wrong. Half of the clothing did not, but we have learned to simply pack it up in a plastic bag and hang it up at the next hotel. Many pilgrims hang their wet socks or t-shirts on the back of their backpacks to dry as they walk, but we’ve found that our system works for us… and the clothes don’t get dusty. The restaurant in the hotel was adequate. There was a cute garden and outdoor café arrangement at the hotel, and that was nice. The hotel was 50 yards from the N-547 highway (one lane each way.) However, we didn’t hear the road noise. This was the third or fourth time that we have stayed in a hotel that was on the far side of a town. That means less walking for us the next day. The albergues seem to be at the entrance to the towns, which mean that all the pilgrims who stay there must get up in the morning and walk through the town before getting back on the Camino. We prefer to put in the extra half kilometer or so in the afternoon and not have to walk through a town in the morning. We needed to have our credenciales stamped, so we actually rode a taxi back into town. We went into the town’s church and got our stamp. It was about 7 in the evening and there was a group saying prayers in the church. The average age of the congregation was probably 75! Again, Arzua wasn’t very interesting. It had a museum of honey, but we were more interested in resting our feet than walking through a museum. So, we had a cold drink on the plaza and returned by taxi to the hotel. It was a gorgeous day – sunny and warm. We watched the games and went to bed… We are happy for only 2 more days!